Subject: Map / plan: 'Metropolitan Museum of Art'. 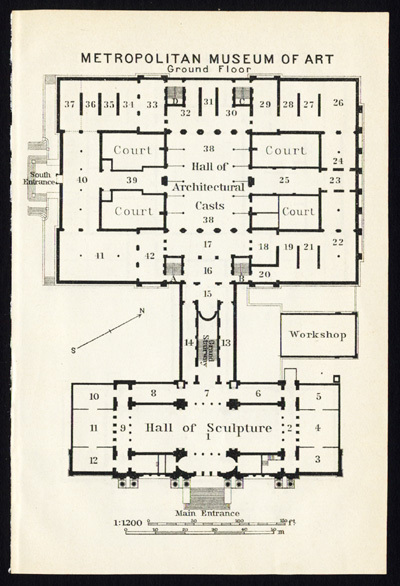 Ground and upper floor plan of the Metropolitan Museum of Art in New York. Condition: Excellent. General age related toning. Original folding as issued. Please study scan carefully. Size (in cm): The overall size is ca. 10.5 x 15.5 cm. The image size is ca. 8.5 x 13 cm. Size (in inch): The overall size is ca. 4.1 x 6.1 inch. The image size is ca. 3.3 x 5.1 inch. Description: This plate originates from: 'The United States with excursions to Mexico, Cuba, Porto Rico, and Alaska. Hnadbook for travellers by Karl Baedeker. ', 4 th ed., published in Leipzig, New York and London, 1909. Maps by Wagner & Debes, Leipzig. Artists and Engravers: Karl Baedeker (1801-1859) was a German publisher whose company 'Verlag Karl Baedeker' set the standard for authoritative guidebooks for tourists.